The first thing to look for when buying a telescopic or pole hedge trimmer is how well balanced the machine is. A poorly balanced model will result in strain on your shoulders and back and it will be more difficult to use. You do very much get what you pay for and cheaper models, although often lighter in weight are still more difficult to use because of this balance issue. These models are often sold under the heading of “telescopic” in the UK. A petrol pole hedge trimmer may be heavier than its electric counterparts but it does have several advantages. Firstly, with a mains electric model, you have a cord attached which can become entangled, especially when cutting tall hedging. Secondly, if you choose a battery model, there is nothing more frustrating than running out of ‘juice’ before you finish the job (although of course, with a petrol model, you will have to wait a short time for the engine to cool down before refuelling – time for a tea-break, methinks)! Finally and perhaps most importantly, you have much more power with this type, which avoids the necessity in most instances, for using a set of manual pole loppers in order to deal with thicker twigs. If you have concerns about exhaust fumes, especially as you will be using your pole hedge trimmer to reach above your head, you need not worry. Carbon monoxide and other fumes from the engine exhaust will be carried safely away from your face as the exhaust is located well away from where you hold the pole. You will need to wear ear defenders if using a petrol-driven model and eye protection is vital – especially as you will be looking up when dealing with taller bushes and shrubs. 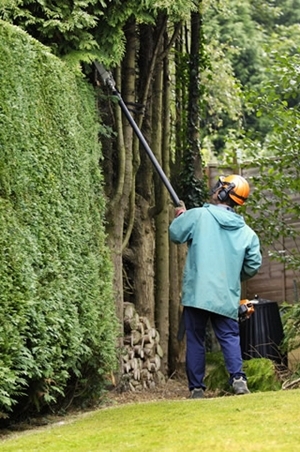 The safety gains are also a great consideration when thinking about whether or not to buy a Pole Hedge Trimmer. Once you have had one for six months or so, you will never go back to your old method of climbing a ladder or cutting platform. Cutting along the tops can easily be accomplished if you choose a model with an adjustable cutting bar head that enables the blades to operate at an angle of 90° to the handle so you can get a nice, straight top line.